Lightly oil broiler pan. In small bowl, combine lemon juice, oil, fennel seed, salt and pepper; mix well. Place snapper on oiled pan. Brush with lemon juice mixture. Broil 4 inches from heat for 5 minutes. Top each fillet with lemon slice; broil an additional 3 to 5 minutes or until fish is no longer translucent in center and flakes easily with fork. Sprinkle with olives. Of the 250 species of snapper, red snapper is the best known. This saltwater fish, named for its color, has firm white flesh and very little fat. 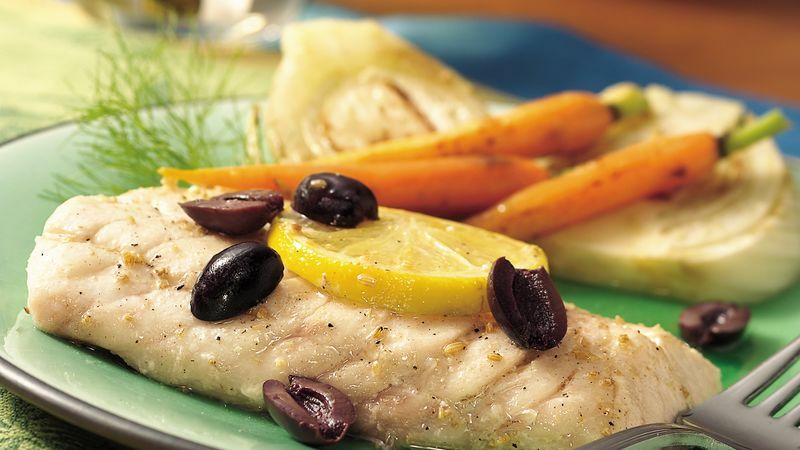 Serve sliced fresh fennel and baby carrots, quickly sautéed with garlic and oregano, with this fish. A mixed-green salad, rustic Italian bread and raspberry sorbet complete the menu.